Every day more and more individuals and companies are looking for ways to make their daily practices greener, both to save costs but also to save money on their power bill. Today we’ll take a look at another utility to help you save money. 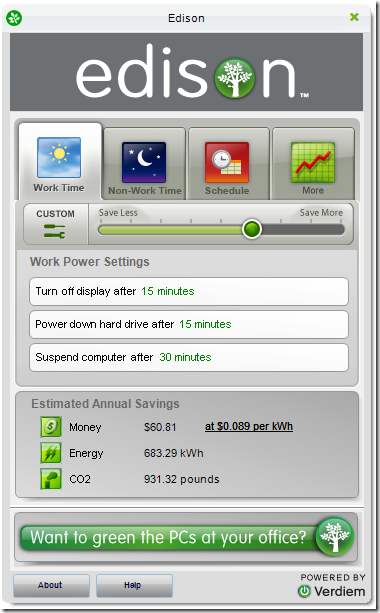 Edison is a small utility which is similar to Uniblue’s Local Cooling Project, that allows individuals and business to cut power consumption on workstations. Sure, we can go into Power Settings in XP or Vista and make the appropriate changes, but this user interface makes it more fun and is much simpler… not to mention the fun statistics on how much money you’ve saved. 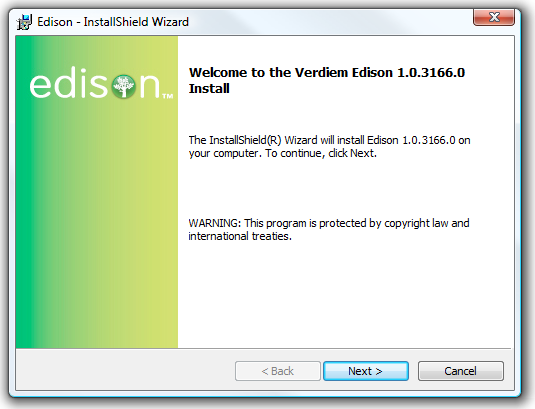 Edison is a 28MB download and will work on XP (Service Pack2) and Vista. Installation is quick and easy. 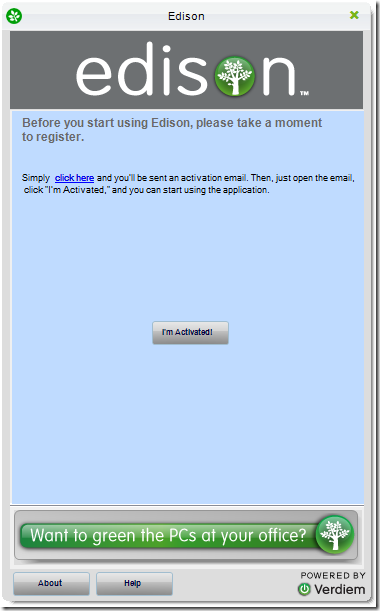 After Installation you will get the Edison screen that will prompt you to register your email account. They send you an activations code, after receiving it, hit the “I’m Activated!” button. Next you can just click through easy to navigate controls to adjust the power settings to be most advantageous to yourself and the environment. The easiest way is to adjust the position of the slider between saving more or less power. 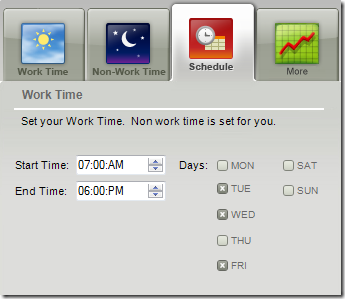 From the UI you can make adjustments to Work Time, Non-Work Time, or a complete custom schedule. Edison is mainly geared toward individual users, while the software company Verdiem has another product which is marketed toward businesses. You can also enter the Give Your Computer a Rest Challenge at carbonrally.com where you can compete with teams from around the country. For an easy way to control the amount of power your computer uses Edison is a great choice.